The evolutionist/creationist debate dynamic seems to be a fairly universal thing. 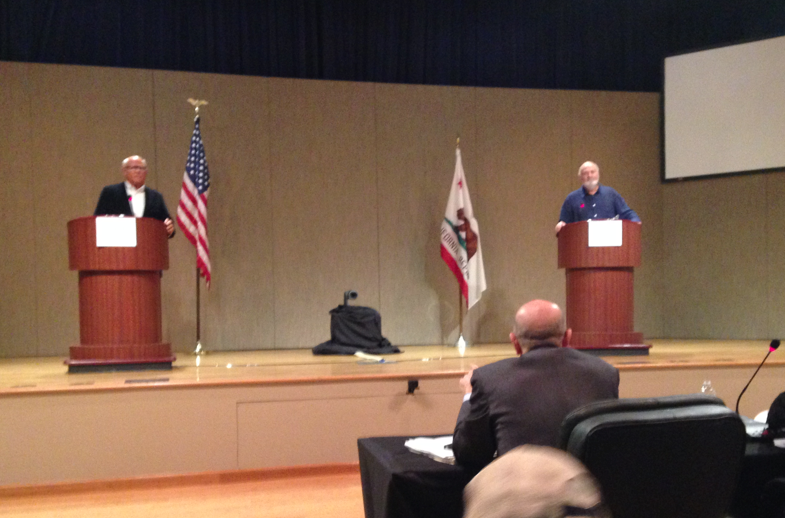 Last night I attended the public debate of Measure R for the City of Malibu. The legislation has been spearheaded by actor/director Rob Reiner. He was challenged by long time Malibu developer and good guy Steve Soboroff. The event was pretty much of a sad train wreck as the honest, decent and humble Soboroff tried to go toe-to-toe with the freewheeling comic actor and made a pretty big mess of it. Reiner used humor, fire and brimstone to play to a crowd of sycophantic hyenas while Soboroff flailed awkwardly. The whole thing was a disgrace. WHEN STEVE MET ROB. For the same reason you don’t want to debate a creationist, you also don’t want to “debate” Rob Reiner (on the right). Businessman Steve Soboroff (left) tried and got his arse handed to him. It was a sad evening for the City of Malibu. What should have been an informative and enlightening debate on a complex set of issues turned into a clown show between a comedian and a flustered businessman. The whole thing felt like it was straight out of the debates between evolutionists and creationists, as well as climate scientists versus climate skeptics. In a nutshell, Rob Reiner, who has had a beach house in Malibu for 20 years, decided to lead the charge to “protect the city” from rampant development (even though there isn’t any — in the past 22 years the population has grown from 12,000 to 13,000 and a grand total of two buildings have been added). He raised $400,000, brought in a team from San Francisco and launched Measure R which will be voted on in another week. The problem, according to the opponents of Measure R, is that he circumvented the system and now has a piece of legislation that if passed will cause all sorts of problems for the city including law suits and the loss of some key resources such as the local Urgent Care facility and movie theater. There’s tons of details you don’t want to know, but the main point is I was seated among the 4 City Council Members who kept shaking their head no to most of the “facts” Rob Reiner cited (like a creationist citing evolution “facts” in debating an evolutionist). Which would have been fine — if only Soboroff would have just played the humble scientist, laying out the information, letting Reiner go on the record with all his mistakes. But that’s not what happened. Sadly, Soboroff tried to match Reiner for showmanship. It was a bad decision. As his humor missed and he failed to land zingers, he eventually dove in with the ad hominem attacks — accusing Reiner of making “back room deals” for which he didn’t have the specifics, implying he was on the take with wealthy developers and trying to occasionally be funny but not managing anything to compare with the actor once known as Meathead. He also tried a few lame references to Rob’s father, Carl Reiner, and “When Harry Met Sally,” that clanked. By the end he was totally in flames. But at the same time, Reiner’s behavior was disgraceful — eventually shouting repeatedly and LOUDLY and angrily at Soboroff. Reiner played to his side of the room who behaved like a pack of Tea Party morons, refusing to obey the rules of keeping quiet. It was pretty much an amateur presentation of, “Inherit the Wind,” with Reiner being the William Jennings Bryan buffoon playing to the rabble and Soboroff being a smart but clumsy, less charismatic version of Clarence Darrow. Overall, it was sad to see the truth get so completely outgunned by theatrics, but that’s definitely what happened. And this is why Genie Scott, when she was head of the National Center for Science Education advised evolutionists to simply not debate creationists. It’s a no-win situation, as it was for Soboroff. Everyone I spoke with felt Rob Reiner “won” the debate. What a mess.